Life is special. Just before our opening on December 1, 2011, we had the honor of meeting both the parents and their eighth grade students from the Camden Rockport Middle School who were chosen to attend a Japanese Exchange in April, 2012. This annual exchange program is with our sister state relationship between the state of Maine and the Prefecture of Aomori region of Japan, which has history going back over 100 years between Maine and Japan. 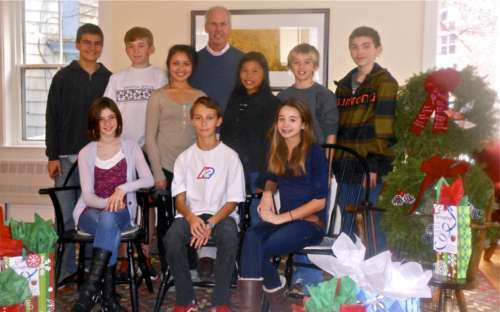 Celebrating its 14th year, the kids needed to raise funds for the cost of their upcoming trip. Enter Maxina Gonzales & Charlotte Horovitz! Both have children attending this years trip and asked us if we would consider assisting the kids in their planned Christmas Wreath Sale & Gift Wrapping event, over the Christmas By The Sea Weekend celebrations in downtown, Camden held December 2-4, 2011. We were pleased to be asked. Joining forces with Boynton McKay, we set out to help support the fundraising efforts of the CRMS Japanese Exchange program! 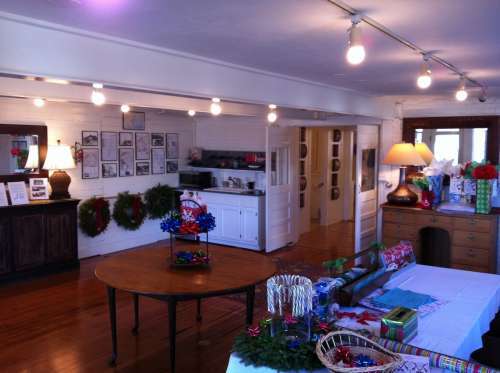 We opened up our back offices for the kids to use, both to display and sell their many wreaths over the holiday weekend and we had a lot of fun as well! The wreaths were handcrafted by the students, many with Origami and Signature bows. 100% of the proceeds of the sale were donated to the students fundraising efforts. 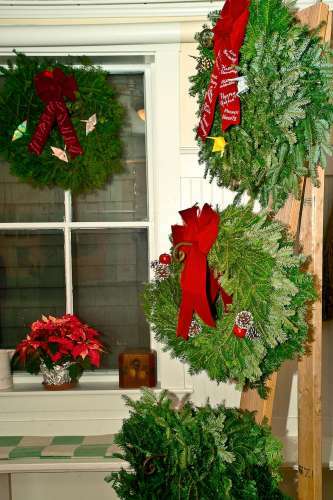 Here are some pictures of the many wreaths for sale as well as the gift wrapping station created by the kids for that weekend. A special thank you to Laura, Max and Charlotte for all their hard work organizing the busy holiday weekend and to the excellent job the kids did working on their own fundraising efforts! One day shortly after just opening our offices, Mr. Russell W. Brace, President of The United MidCoast Charities, walked into our offices and asked if we had interest in supporting the United MidCoast Charities upcoming 2011 Holiday Pops Concert playing at the Strom Auditorium on December 17, 2011, but more importantly, asked, "Did we still believe in Santa Claus...?" Well that was all it took, and within seconds, after saying..."Well yes of course, and you believe, right? "Rusty" had his back cover sponsor (and proudly!) 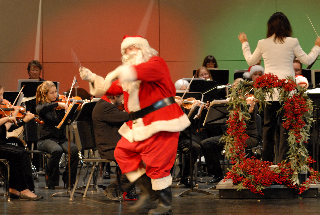 for the 2011 Holiday Pops Concert program, put on by the Maine Pro Musica Orchestra! The evenings concert was lead by local Conductor and Music Director, Janna Hymes. It was a wonderful evening and we were delighted to support such a cause and to help be a part of a community effort with many other sponsors. The United MidCoast Charities do work through 50 agencies within Knox and Waldo counties, all donating time and money to raise funds and awareness as well as work tirelessly to improve the quality of life for those less fortunate, now for 70 years! "Thank you again Rusty", for stopping in that fateful day and it is our honor to be a part of The United MidCoast Charities family of sponsors! Here is a picture from that magical evening, and of our favorite person performing that evening to a sold out auditorium! See, we still believe!